The Middlesex University team has profiled its work to billions of people worldwide, creating clothes and props worn by Brazilian performers in the Olympics Closing Ceremony. 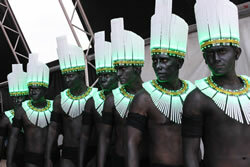 The group was tasked with illuminating 140 of the costumes by integrating lights and electronics to the majority of the outfits worn in the Rio de Janeiro 2016 handover section of the show, as well as working on a number of the props. For some of the performers, including the Amazonian warriors, the team created their whole costumes from scratch, ready for Sunday night’s ceremony (12 Aug). Project managed by Middlesex PhD student Sid Odedra, the team of six recent Product Design and Engineering graduates who finished their course in June worked intensely on the tailor made costumes and props (including illuminated headdresses, capes, wheels and 80 drums) to ensure they were ready for the ceremony. 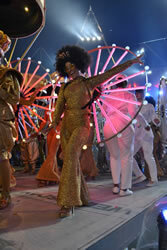 The talented team even featured on stage amongst the performers to ensure the performance went smoothly, as well as working with the cast backstage where they helped to dress the performers and ensure the complex electronics were correctly synced with the music, dance routines and lighting in the Olympic Stadium. Sid and the Middlesex students had been selected to work on the project after impressing top lighting designer Moritz Waldemeyer, who they had previously worked with on other high profile projects such as an Ellie Goulding music video and a Take That concert. The team’s creations were well received by performers and spectators alike, with Moritz Waldemeyer saying he was “over the moon” with their work. The Middlesex University team consisted of Sid Odedra, Iliyan Kukushliev, Rebecca Board, Dean Chapman, Witold Mielniczek and Puja Varsani.